Every editor of the Policy Studies Review Annual brings a unique perspective to bear in selecting articles to be included. This perspective reflects varying methodological and disciplinary judgments, varying judgments on what the field of policy studies or policy analysis is and where it should be going, and varying judgments regarding the quality of articles which are or claim to be in the field. Because it is the objective to assemble a set of essays which are both interesting and topical, there will be varying perspectives on these matters as well. The volume clearly reflects the editors perspectives. They are explicit about these judgments and perspectives, and then let the content of the volume speak for itself. First, we are both economists. As a result, the general topics selected and the articles chosen under each topic tend to emphasize economics more than the other disciplines involved in the field of policy studies—sociology, psychology, political science, law, and so on. This emphasis is clearly seen by comparing the contents of volume I (edited by Stuart Nagel, a political scientist) and volume II (edited by Howard Freeman, a sociologist) with that of this volume. 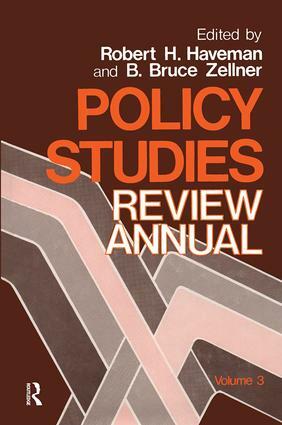 Second, the editors have a particular view of what policy studies or policy analysis is. That view has several aspects. In the first place, they feel that the field of policy studies or policy analysis must define itself, and this definition will develop as researchers do just what the title of the field says—study or analyze policies. A corollary of this view is that we place a low weight on papers which discuss the policy process or reforms in policy-making, relative to papers which analyze a policy, a policy proposal, or a problem which leads to calls for policy action. What Can We Get from Effluent Charges? Can Welfare Reform Eliminate Poverty? Selective Employment Subsidies: Can Okun’s Law Be Repealed? Proposition 13: Tax Reform’s Lexington Bridge?